As Americans we believe we have the best healthcare system in the world. But think again, it’s really not the truth. We do have superb medical schools, very well trained providers, superb science and technology but the delivery of medical care is just not what it should be. We spend more for healthcare than any other country does on a per capita basis. And yet when we compare ourselves to other countries, especially developed countries, our outcomes are not better. Our life spans are somewhat shorter than countries such as Japan and our infant mortality is somewhat higher than countries like England and France. We tend to focus on disease and injury but not so much on illness prevention and health promotion. We all recognize that as a society we have some adverse lifestyle behaviors such as overeating a non-nutritious diet, being fairly sedentary, having chronic stress and having 20% of us still smoking. It’s quite clear that the best chance we have for increasing our life span and overall improving our health is to adjust our personal behaviors and to do so at an early age. The diseases that occur have changed substantially over the decades. At the beginning of the 1900’s it was infectious diseases that caused most deaths. Over time they came under reasonably good control with preventive techniques such as immunizations, sanitary sewer systems and clean water systems and then, of course, antibiotics. Meanwhile chronic illnesses such as coronary artery disease became much more prevalent. Even though fewer people smoke than a few decades ago our obesity and our lack of exercise have led to rapid increases in diabetes, heart disease, stroke, high blood pressure and many other chronic illnesses that last a lifetime. Our medical care system does not deal with health; it really concentrates on illnesses or trauma. In addition more and more illnesses today are chronic and complex, lasting a patient’s lifetime and bearing very high costs. The best way to care for these chronic illnesses is with a multidisciplinary team approach. This is just not the typical way our medical care delivery system is organized. We tend to have a system that relies on a single provider treating an illness – the internist gives an antibiotic for pneumonia and the surgeon cuts out the diseased gall bladder. But patients with chronic illnesses really need multiple providers. For example, the diabetic may need in addition to a primary care physician, an endocrinologist, an exercise physiologist, a nutritionist, an ophthalmologist, a vascular surgeon, a nephrologist, etc. But this team needs a coordinator or quarterback and this is preferably the primary care physician. Good care coordination can direct the patient to the care he or she needs while reducing the number of specialist visits, procedures, tests and imaging — with the result that the quality of care goes up and the cost of care goes down substantially. Stephen C. Schimpff, MD is an internist, professor of medicine and public policy, former CEO of the University of Maryland Medical Center and consults for the US Army, medical startups and Fortune 500 companies. 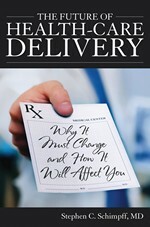 He is the author of The Future of Medicine – Megatrends in Healthcare and The Future of Health Care Delivery, from which this post is adapted. Next post > Should doctors talk about the cost of drugs with their patients?